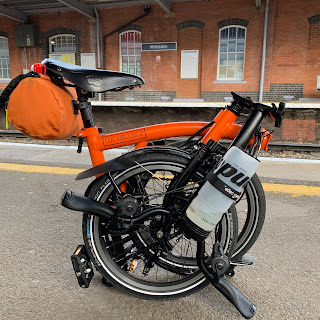 Despite having a dynamo powered front light in the form of an Edulux II and possibly the same to go on my new Orange Brompton, I am a big fan of Exposure lights. I have a Toro Mark 7 which can quite happily pump pump out at least 900 - 1000 lumen constantly over 6 hours without incident. I have had mine for just under two years and it has been faultless. A few weeks ago it did develop a fault in that the LCD panel where you see the remaining run time lost its illumination. The light still worked Ibn every other way but seeing the amount of juice left in the light proved difficult. 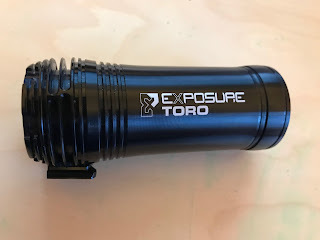 I contacted Exposure Lights by email and in less than two hours I received a returns number. Packing the light up, I sent it off and thought I might have to wait a few weeks before getting the light back. 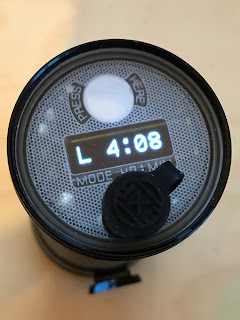 Another email from Exposure informed me that they had received my light safely and 8x days later my light was back in my possession with a new LCD fitted and working perfectly. Credit where credit is due, Exposure made the whole process of getting my light repaired painless. As for my Torro front light, it will continue to be a loyal companion on all manner of rides boosting the level of illumination from my dynamo front light as and when required. London to Southend Overnight (Well almost)!